17th century onwards. A simple bed, often accompanied by a small bed on wheels that was stored underneath. Both beds are strung as they would have been at this time. Late 16th century onwards. A panelled cradle mounted on wooden rockers. Wooden pins along the sides could be laced with cords to keep the bedding and baby in place. Finials at the corners aided rocking by hand. As above but a single rather than a double. 18th century onwards. The forerunner of the modern wardrobe. A large cupboard with a drawer below. Inside the cupboard was split into two parts: one part with shelves for folded clothes and the other with pegs on which to hang clothes. 16th century onwards. A strung canopied bed with a high panelled headboard between two plain posts and with two decorative posts at the foot. Curtains would normally be hung to enclose the bed for warmth. Late 19th century onwards. The next stage after the clothes press. The inside of the cupboard now has just a single rail on which to hang clothes and a large drawer below in which to store folded clothes. Mid 18th century onwards. Used to hold a jug and basin for personal washing. There was a wooden splash board around the top to protect the wall from water. Mid 18th century onwards. Used alongside the washstand for hanging towels. The pair of rails at the top could be used to dry a wet towel by hanging it across both rails. Supplied with two towels. 16th to 17th century. A wooden bucket within a wooden box with a hinged lid. Only used in well-to-do homes where servants would empty and clean it. A simple jug with basin, frequently used with a bedroom washstand for washing in the days before plumbing. Available in pink, blue or green. Early 17th century. Most people of this era kept their clothes in chests or on pegs on the wall. The more affluent had this early form of clothes press. The bottom of the press was open inside to be used like a chest, while the top section had pegs on which to hang clothes. 18th century onwards. Before dressing tables became common, a freestanding mirror would be placed on top of a table or chest of drawers to be used when ‘making one’s toilet’ - the act of washing and getting dressed, hence the name toilet mirror. 18th century onwards. Before the installation of toilets inside houses, a chamber pot was used at night. It was sometimes kept under the bed but quite often a special cupboard was used to hide it from view. 18th century onwards. The chest of drawers derives its name from the early chest, which was basically a box with a hinged lid. Later, came the mule chest, which had a drawer at the bottom of the chest. 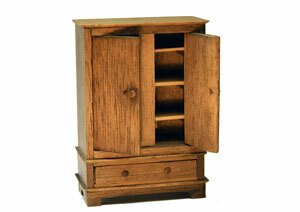 It was called a mule because it was a hybrid between the old chest and what was to become the chest of drawers, i.e. a chest entirely taken up with drawers and without an opening top. Early 16th century onwards. A simple box of moulded boards hung between two upright posts that were joined together by two stretchers at floor level.